It’s been an insanely long week and now its back to Monday. Which I must say, I normally don’t welcome Monday like I’m welcoming this Monday. Last week was not our week. In fact, it could have topped off as one of the most stressful weeks of the year (so far). Hence why ice cream is showing up for you on Monday. Not that anyone would ever emotionally eat mounds of ice cream from stress? 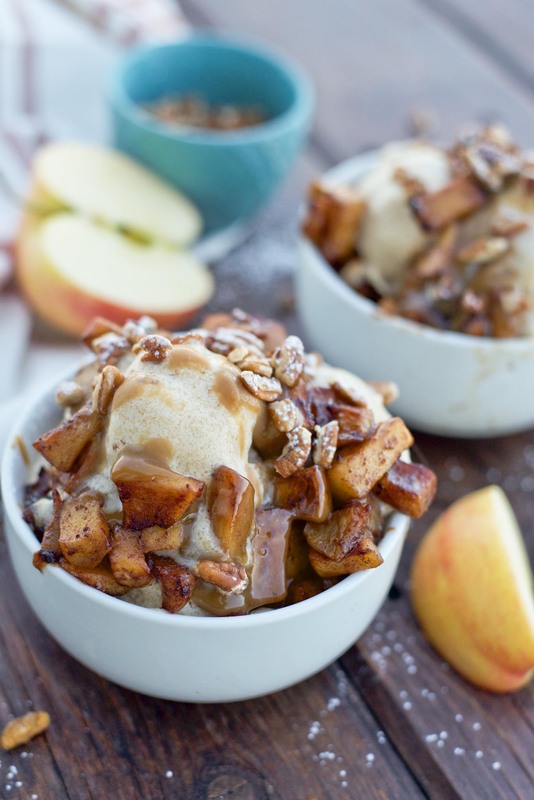 Of that you would complain about caramel apple cider ice cream with caramelized apples? It may go down in history as one of the best ways to start the week. 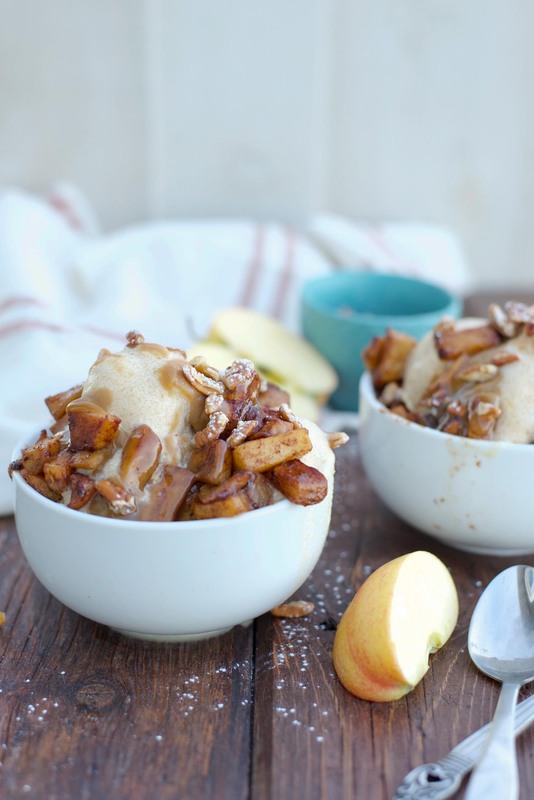 The soft, apple spiced ice cream with the swirl of caramel topped with the piping hot caramelized apples and pecans that just begins to melt the outer layer of ice cream is not just a good way to start the week, it is pretty stinkin’ fantastic way. But don’t worry, you don’t have to feel so bad when it is homemade ice cream made with less sugar, more spice and all things nice. I’m actually quite ashamed to admit that I think my favorite part were those caramelized apples. But I’m not a huge ice cream girl like the rest of the clan. Go on, it’s okay you have my full permission to start this beautiful fall week with homemade ice cream. The special occasion, a break from life. Is that reason enough? In other news, I think we have a bit of a problem on our hands. Our middle daughter (one of the unruly employees) has been waking up quite often through the night. For no reason other than the million and one needs she has, including a snack. Oh don’t worry, my kids don’t get midnight snacks. No-no I’m a firm believer in utilizing your own fuel sources at night, even at a young age. But she has gotten into this thing of eating pretend snacks at night. So last night this is how it went down. I get up, pick her up and carry her back to her bed to lay down in hopes of getting a few minutes of shut eye while she is going back to sleep. Not long after I close my eyes I hear her lips smacking and a pretend munching sound followed by, “mmmm, mmmm, these are good.” In my head I’m thinking, what in the world is happening?!? Did she stash food in her bed (not unlikely in our house, we find the weirdest things in the weirdest places). In a panicked, terrified kind of way in the dark of night I quickly feel her fingers to see if she has something she is really eating. Nope just pretend M&M’s around midnight last night. Because apparently every 2-year-old needs a midnight snack of M&M’s. I’m still not even sure what all happened last night. I can tell you that I wasn’t thrilled by the scenario that happened or what possessed her to eat a pretend snack at midnight . That girl, there is always a thought and no reason other than what is happening in her own little head. And trust me it is a lot cuter and funnier now than it was at 12:00 am last night. Yea, not as funny when momma was tired. After getting a full glass of cold water tipped on my head I really wasn’t in the mood to listen to her eat her pretend M&M’s. But a new day is here and while we pretended to eat chocolate at midnight, this is no dream. 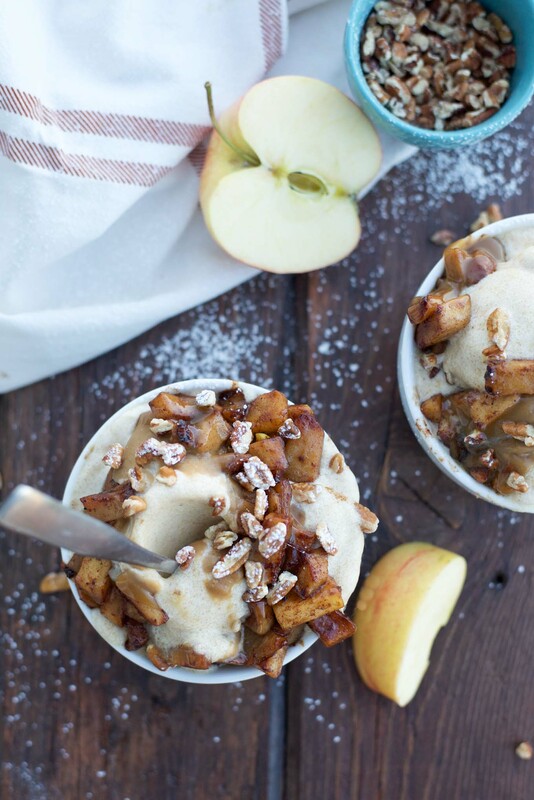 This caramel apple cider ice cream with caramelized apples is the real deal. 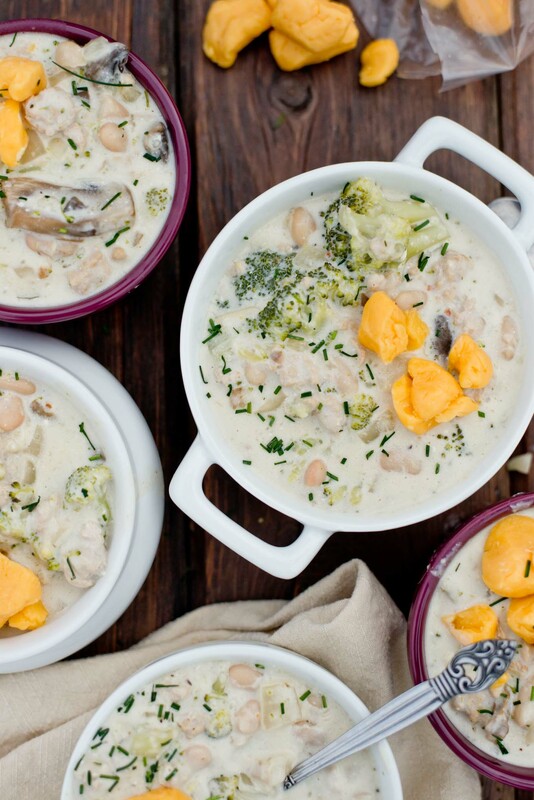 Now go get this prepped so you can have it tonight too! And please, don’t even pretend to eat M&M’s at night, mkay?!? Make Caramel Sauce according to directions. In a medium saucepan, add apple cider, cinnamon sticks, coconut sugar and vanilla. Bring to a simmer and let simmer 20-30 minutes or until cider is reduced in half being careful not to burn. 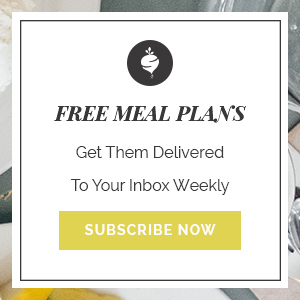 Let cool to room temperature and pour into a ziplock bag along with milk and gelatin. Close tightly and the mix to incorporate. Place in refrigerator until chilled. Pour ice cream mixture into ice cream maker and turn on according to the directions. 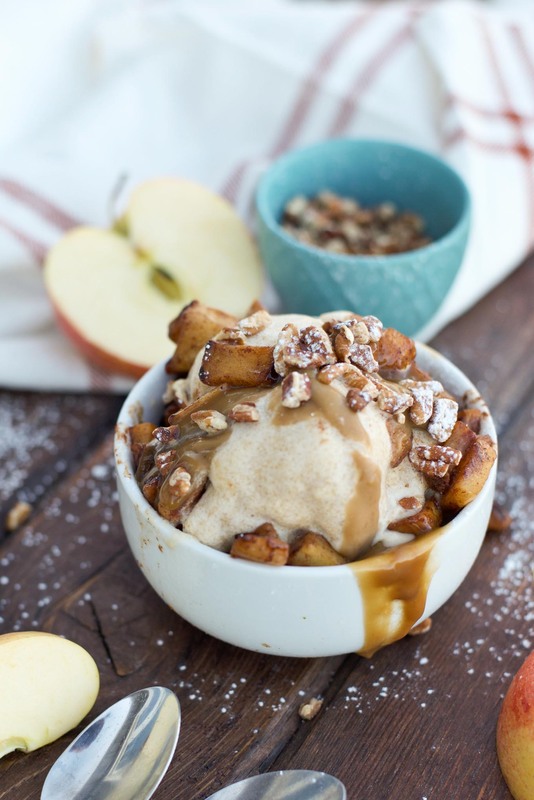 Once ice cream begins to thicken, add in ½ the caramel sauce and swirl. While ice cream is making, peel, core and chop apples. Place butter in a skillet over medium heat, add spices and cook until fragrant (about 1 minute). Add in apples and mix. Cook about 5 minutes or until apples begin to soften and add maple syrup. Cook an additional 2-3 minutes. 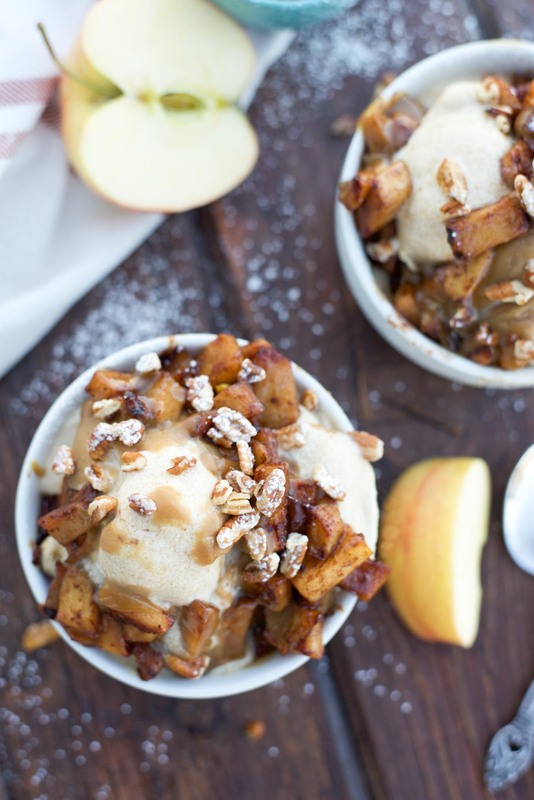 Scoop out ice cream into bowls,top with caramelized apples, pecans and drizzled with caramel sauce.